Yup, that’s Julia Louis-Dreyfus and Bryan Cranston sucking face right before the “Veep” star went on stage to accept her Emmy for Best Lead Actress in a Comedy. 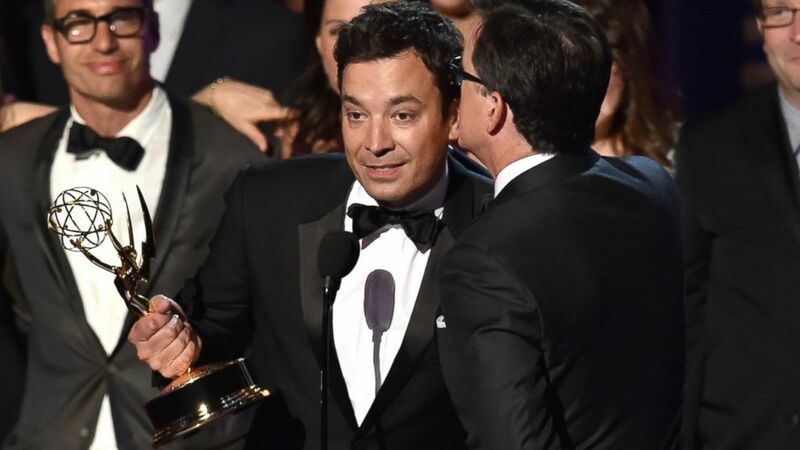 The look on Jimmy Fallon’s face afterward tells me that bit wasn’t scripted at all. Even if it was, everyone watching last night’s award show gasped in horror and amusement as Cranston swooped in for a little “Seinfeld” reunion. Weird Al’s rendition of our favorite nominated shows was hilarious (and well, weird) but my favorite part was seeing Andy Samberg dressed as Joffrey from “Game of Thrones.” That looks like an SNL sketch that needs to happen ASAP. Not all surprises are good. Right off the bat, everything about that segment seemed a bit off. It seemed like Sofia Vergara’s introduction for the Television Academy chairman Bruce Rosenblum was supposed to be funny but it didn’t quite work. Then the spinning platform bit was a horrible mix of funny, misogynistic and distracting. Most importantly, it was unnecessary. If the producers wanted to make Rosenblum’s remarks more interesting, the could’ve done a wealth of other things. I understand the non-show businesses people involved in this awards show aren’t exactly the eye candy that brings the ratings. But they have an essential role in the operation and I think we can spare them two minutes to talk about something important without doing something stupid. The internet has dubbed it as Jimmy Fallon “Kanyes” Stephen Colbert’s acceptance speech. That’s a bit of a stretch. I saw it as two comedians playing a joke on each other and really funny joke at that. It stemmed from Gwen Stefani’s butchering of the show title, calling it the “Colbort Report” and making her Twitter’s new John Travolta (cue the Adele Dazeem jokes). The acceptance speech that followed was reminiscent of the time Colbert, Fallon and Jon Stewart wrestled to the stage at the Emmys in 2012 when “The Daily Show” won that same category. We’d love to hear your comments! What were your favorite moments? What did you think of Sofia Vergara and the platform?